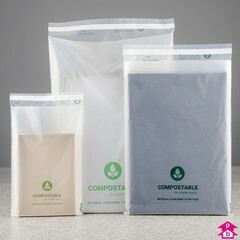 A selection of high strength eco-friendly biodegradable mailing bags that will biodegrade as industrial compost and starch-based compostable mailing bags suitable for industrial or domestic composting. Available in a large range of colours and sizes. 6 Products. Semi-transparent mailing bags made from a compostable material that is milky-white in colour, silky to the touch, and made from natural biological sources (such as potato-starch) that is suitable for industrial or home-composting. The compostable material is also thermoplastic and plasticiser-free. The back (sealing side) of the bags are printed with a green compostable leaf logo and the words 'COMPOSTABLE for a better world', with 'MATERIAL CONFORMS TO EN 13432' underneath. With self-adhesive peel 'n seal strip (see notes).Sender address box and safety warning notice printed on the flap. 100% biodegradable and compostable in accordance with EN 13432. Biobased carbon-share of entire formulation exceeds 30% (in accordance with ASTM D6866). Certified "OK Compost HOME" by Vincotte. Designed to disintegrate in industrial compost units in less than 90 days. Suitable for domestic composting (disintegration time will vary, but normally taking longer than 90 days). Store bags away from humidity, heat sources and direct sunlight; use within 6 months of delivery. Due to the nature of the material the peel 'n seal strip is only semi-permanent on initial contact sealing. A permanent seal requires the mailer to be left at room temperature for several hours once sealed. 5 Products. 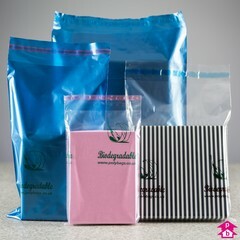 A range of clear and blue high-strength eco-friendly mailing bags that will biodegrade as industrial compost. All sizes are printed with a green biodegradable leaf logo to show your customers that you're considering the environment. 4 Products. 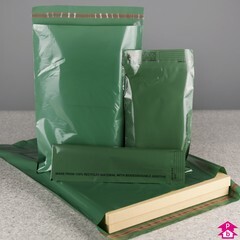 These Green mailing bags are not only made from 100% recycled material but they are also biodegrable, making them very Green mailing bags indeed! The bags have a peal 'n seal strip and are printed with a 'Sender' label and a safety warning notice on the lip, with the words 'MADE FROM 100% RECYCLED MATERIAL WITH BIODEGRADABLE ADDITIVE' in small black letters along the bottom of the front of the bag. We can also make any size or customise any bag with your own logo or design, please see our Made To Order section. Due to their biodegrability these bio-mailers have a recommended 1 year shelf life. Boxed in 200's.